An amazing deal on our complete Guitar course! Rock, folk, pop, gospel, country: PLAY THE SONGS YOU LOVE – in their entirety – even if you’ve never played any type of musical instrument before! Even if you thought you had no talent at all, now you can accompany yourself and your friends and sound terrific. 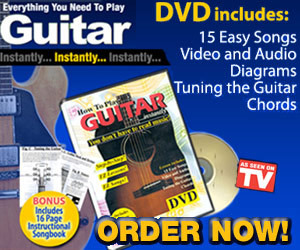 The 16-page book has diagrams of all the examples and songs included in professional musician and instructor JOHN DERBIN’s video and audio lesson. The lesson book includes the chord layouts for all the songs; it is the perfect companion to the video and/or the audio tape. Easy, illustrated lessons, including chords and hand strokes for all the songs.